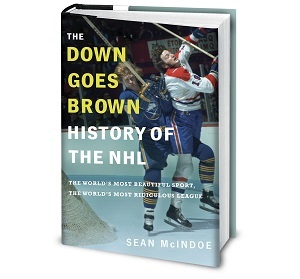 Down Goes Brown: Blog fight! For those of you who read this site but not Pension Plan Puppets (i.e. my wife -- hi honey, don't forget to pick up some milk on the way home), that site is currently featuring a lively debate on the upcoming Brian Burke hiring. MF37 from Bitter Leaf Fan is leading the anti-Burke charge, and I'm representing the pro-Burke faction. Needless to say, I'm the one on the left. Why is MF37 wearing another team's jersey? No idea. Personally, between this and not liking Brian Burke, I question his loyalties. Well I guess it's better than putting me in the bleu, blanc et rouge.